Convergence: The Atom #1 is out 4/8 and writer Tom Peyer and artist Steve Yeowell pick their fave stories and covers! The Atom is one of those characters that I always took for granted. Turns out, I’m not the only one because for the better part of the last 50 years, it’s been tough for the Tiny Titan to sustain his own title. I’m not trying to be a downer or anything. I’m just trying to point out that when you fail to appreciate something enough it goes away. But then, absence can make the heart grow fonder and now whenever I see the Atom, I get a lot more excited than I ever did when he was just floating there in his little JLA chair. My own favorite Atom story. So of all the Convergence titles, the Atom book by writer Tom Peyer and artist Steve Yeowell was one that instantly caught my eye and got me really excited for this entire event. And rather than just go on and on myself about just how cool this character actually is, I asked Peyer and Yeowell to do it instead. We plan on doing this on a regular basis with various Convergence characters and creators over the next two months, so pull up an alternate reality and check out what these guys dig. 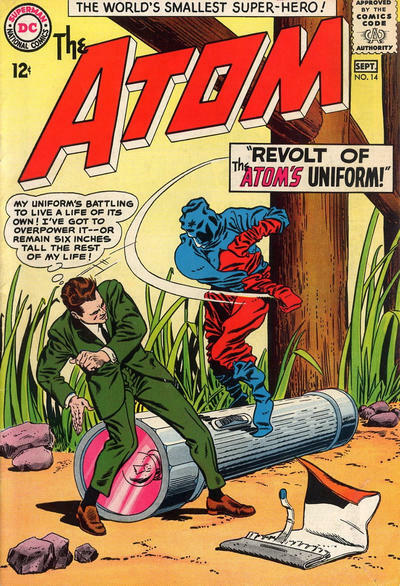 Dan Greenfield: What are your favorite stories of all time starring the Atom? Tom Peyer: Fond as I am of all Atoms, from Al Pratt through Ryan Choi, my favorite stories all star Ray Palmer. That’s because there are no heroes like the heroes you knew as a kid. Ray has the added distinctions of being the first hero I followed from the beginning of his run, and the first one I wrote an issue of all by myself. 1. 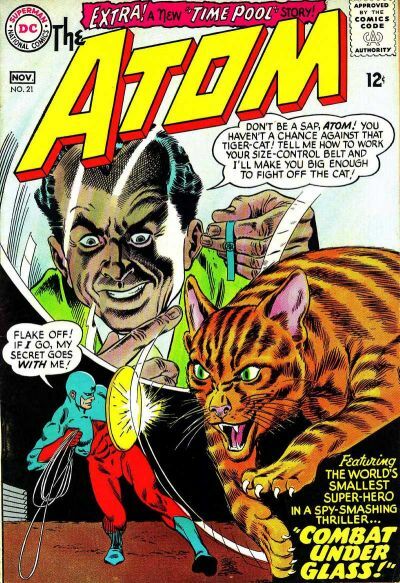 The Atom #21, Oct.-Nov. 1965, “Combat Under Glass!” Some enemy spies capture the Atom, take his size-changing belt, trap him under a glass dome, and sic a housecat on him! How did the Tiny Titan defeat a kitty? What a stupid question! He used judo, of course! As soon as they started letting me write Atom stories I repeated this gag, because I’m weak. 2. 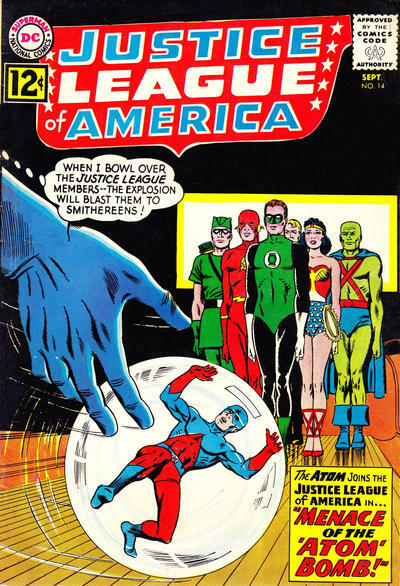 Justice League of America #14, Sept 1962, “Menace of the ‘Atom’ Bomb!” A new villain, Mister Memory, tests his De-Memorizor by making everyone forget about the Atom, including Atom himself. The JLA thinks it’s weird that they have no memory of the Atom, so they investigate. Mister Memory makes the Justice League forget who they are, lines them up like bowling pins, sticks the Atom inside an exploding glass ball, and bowls him at his fellow heroes! 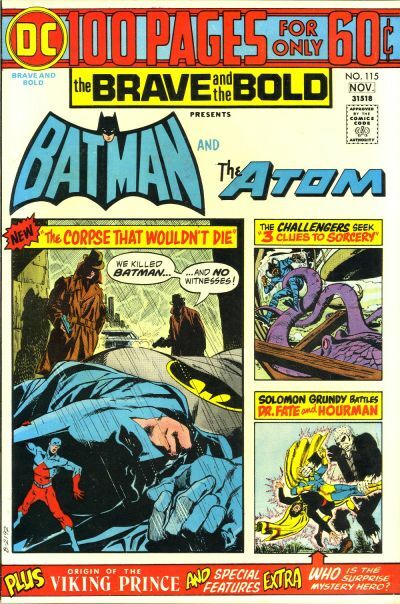 Atom saves everyone and they unmask Mister Memory as — Batman! Prof. Amos Fortune had de-memorized the Caped Crusader and made him do the dirty work. The heroes capture Fortune and induct Atom into the Justice League! 3. Sword of the Atom #1-4, 1983. It’s the ’80s, so Ray grows up, divorces his unfaithful wife, gets stuck at 6 inches, finds a lost tribe of miniature aliens, has an Edgar Rice Burroughs adventure and falls in love. Jan Strnad wrote the most emotional Atom story ever, with sublime art by Ray‘s co-creator, Gil Kane. What’s the most fun part of working on Convergence with the Atom? It’s a reunion with Ray and my first shot at Ryan. It’s also a reunion with the Steves, Yeowell and Dillon, with whom I share fond memories of the early days of Vertigo. And it’s my first time working with editor Marie Javins, which was a pleasure. 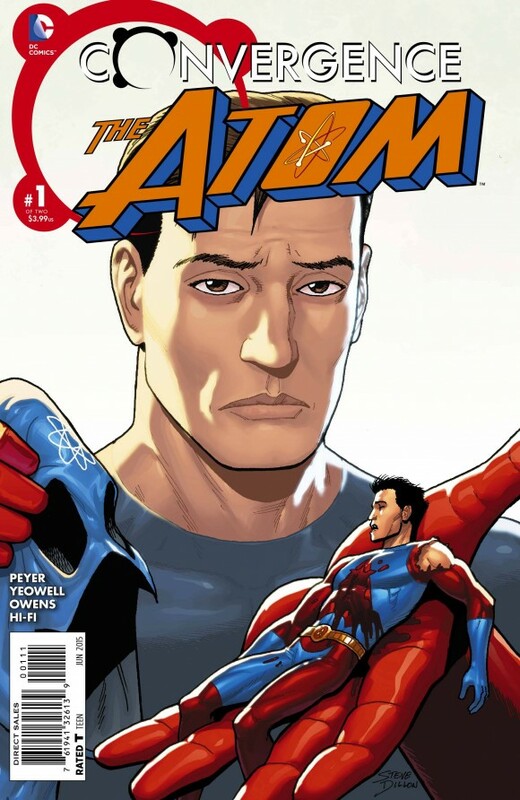 Dan Greenfield: What’s your favorite cover starring the Atom?